Moving overseas for work is stressful enough as it is without having to worry about what you are going to do with all your stuff. It can be especially stressful if you are leaving all of your stuff behind and you don’t know what you are going to do with it. If you are moving overseas for the long haul, or just for a little while, and you are using short term storage while you figure out what you are going do, below are some tips for moving your items. If you are going to be storing the majority of your furniture, you are going to want to maximize your return on investment by breaking down everything that can be broken down. Couches, bed frames, and shelving that can be disassembled should be. It will save you a lot of money on short term storage space. If you are going to be moving a lot of larger, heavier items, you might want to consider looking for a short term self storage facility that offers drive up access to the unit. This way you can just recruit a friend to help you move and don’t have to call an expensive moving company in to help you. When storing your items, it’s a good idea to make sure that everything you store is protected from water damage. Store furniture off of the floor by using wooden pallets or moving pads, and try to avoid placing cardboard boxes directly on the ground. You can stack them on top of plastic crates, wooden pallets, or other things in the unit, such as furniture. One of the most important aspects of storing your items while you are away is taking the time to plan for making it easy to take your items out. You should always organize your short term storage unit so that the heaviest items are at the front, and there is a clear pathway that allows you to access every part of the unit. Storage might seem like one more added hassle you have to endure while you are trying to move your life overseas. 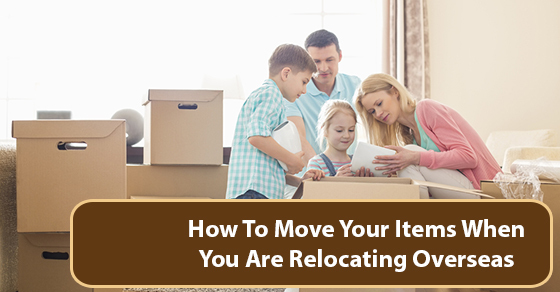 Worrying about what will become of your belongings while you are away, and more importantly, how you are going to get them from your current place into storage, can definitely feel like drudgery. But, if you keep the above moving and storage tips in mind, you can leave the country feeling comfortable that your items are safe, sound, and ready to use when you get back.